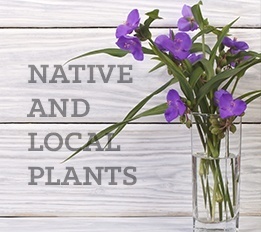 Celebrate the Midwest by choosing native plants, or wildflowers, for your garden. Native plants are already acclimated to the area, so they don’t need much help surviving the climate, pests, or disease. Since wildflowers are more self-sufficient than non-native plants, they save gardeners time, energy and money. Thinking locally when planning a garden also helps sustain the environment. Wildflowers have been dying off because of urban development, agribusiness, and invasive plants. Reintroducing native plants helps protect the indigenous wildlife habitat, encouraging the genetic diversity required for a balanced ecosystem. Give your garden local flavor by adding some of the following varieties to your yard. Spiderworts are perennials that boast grassy foliage and three-petaled flowers, which bloom in the spring. They can survive in moist soil exposed to the sun or shade, and can reach three feet in height. A unique grass, little bluestem changes colors throughout the year. In the spring and summer, the grass takes on a blue-gray shade. In the fall, however, its coloring shifts to a purple-bronze. Little bluestem thrives in full sun, with well-drained soil. It will eventually grow to three feet tall. In the spring, wild anemone acts as a convenient groundcover, filling bare spaces with its large, white blossoms. This plant prefers rich, moist soil, as well as partial sun. It can grow to two feet. This variety is known for its distinctive hooded green flowers, red markings, and bright fall berries. It needs shade and moist soil. Healthy Jack-in-the-Pulpits can grow to two feet tall. Despite its foreboding name, bloodroot is actually a delicate little plant that resembles a daisy. It only blooms briefly in the spring, but makes a big impact. Plant summer flowers alongside bloodroot so there’s something to take its place when it goes dormant. Bloodroot can grow to be one foot tall if planted in shaded, well-drained soil. In late spring, columbine’s red and yellow flowers begin to attract beautiful butterflies and hummingbirds to gardens. These plants can prosper in the sun or shade, as long as soil is well-drained. They can eventually grow to two feet tall. The clean, white blossoms of the penstemon flower in the early summer. The foliage of these perennials takes on a lovely burgundy hue. With full sun and moist, well-drained soil, penstemon can grow to two feet. Swamp milkweeds bloom in mid-summer. At that time, butterflies flock to their attractive pink blossoms. Swamp milkweeds need full sun, but other than that, they can flourish in average to moist soil. They can grow up to five feet. With pale pink petals surrounding raspberry-red cones, these plants cheer up gardens in mid-summer. Coneflowers self-seed, so prepare for a nice blanket of color. Pale purple coneflowers like full sun and well-drained soil. They grow to forty inches in height. Butterflies love the white flowers of this tall, interestingly-shaped perennial. You will love it too, as it can tolerate both full sun and partly shaded environments. Culver’s root prospers in moist soil and grows up to six feet. The name, “Butterfly weed,” is slightly deceptive. These summer plants may attract butterflies, but their vibrant orange flowers brighten any garden. They are especially easy to care for, as Butterfly weeds are strong enough to withstand pests, disease, and drought. These welcome weeds require sun and well-drained soil. They can grow to four feet. At nine-feet tall, the compass plant makes a statement in the summer. Its height and yellow, sunflower-like blossoms provide vertical interest for any garden. As an added bonus, compass plants can withstand dry weather. Their name refers to compass plants’ ability to adjust themselves based on the amount of sun they want to receive. For brightly-hued groundcover resistant to both pests and drought, plant poppy mallow. Magenta flowers will decorate your lawn all summer long, provided that they are exposed to full sun and well-drained to dry soil. Poppy mallows grow to eight inches. These prairie perennials produce lovely blue flowers in the early fall. Blue sage needs full sun and well-drained soil. It can grow to four feet tall. Goldenrod is a beautiful fall flower. As its name suggests, goldenrod yields clusters of golden-yellow blossoms. These native plants prefer full sun and well-drained soil. They can grow up to four feet tall.